I am sitting here in the surgical waiting room at Northwest Community Hospital, just outside of Chicago. Florescent lights hum overhead while visitors flip casually through month-old magazines. At one point, a group of tittering young women breeze by clutching congratulatory balloons on their way to the maternity ward. The clock ticks in the background, persistent and unrelenting. It is 2:48 pm, and at this very moment, my mother is undergoing a double mastectomy for breast cancer. Until recently, the word was merely an abstraction. Cancer arose in conversation as a nameless statistic; an anecdotal story about a friend of a friend of a friend; a scribble in a surgeon’s notebook from the past. Cancer was someone else’s nightmare, someone else’s pain. Now, quite unexpectedly and intrusively, it has become a part of my own life’s story. As a medical historian, I am comforted by the knowledge that none of us are alone in our struggles against disease. And so that got me thinking about breast cancer, and the countless women from earlier periods who underwent mastectomies without anaesthetic. Who were these brave women, and where did they gather their strength from? It may come as a surprise to readers that physicians and surgeons have been diagnosing women with breast cancer for thousands of years, and performing mastectomies for nearly as many. In the 1st century A.D., the surgeon, Leonidas from Alexandria, described his technique for removing the breast which involved alternately cutting and cauterising the tissue with hot irons. During the Middle Ages, many surgeons began using a caustic paste which contained corrosive ingredients such as zinc chloride and stibnite. When applied directly to the breast, it would cause the tissue to undergo a rapid necrosis, making it easier to remove. This, too, had its risks, and for the most part, surgeons continued to remove the breast without the aid of caustics in the following centuries. 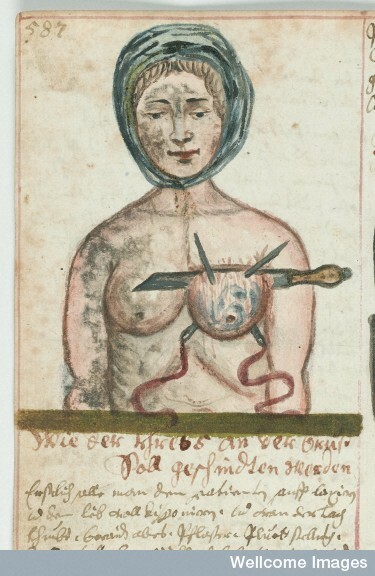 Each surgeon had his own technique for doing this, ranging from ‘impalement of the breast with needles and ropes for traction followed by swift amputation through the base’, to incising the skin and removing the tumour by hand. The surgery was typically carried out in the patient’s home, and could take hours. After the procedure, the wound was often left open to reduce the risk of infection. All this was done without anaesthetic. But what of the women themselves? Those poor creatures who lived and died at the mercy of the surgeon’s knife? Unfortunately, it is difficult to know how they felt as women are often voiceless in the surgical casebooks which I study. Occasionally, however, I come across a letter or diary belonging to a survivor. One particular letter stands out in my memory as I sit here waiting for my own mother to come out of surgery. As hard as it is to imagine, Lucy Thurston survived the horrific event and lived for another 21 years after her mastectomy. And so history is full of such stories…some lost to time but no less real. It is this lineage which my mother is about to enter. A sisterhood of sufferers. A sisterhood of survivors. It is now 3:58 pm, and I have 1 more hour before my mother is out of surgery. Then, a new life begins: one shaped by cancer but not ruled by it. 1. William L. Donegan, Breast Cancer, 2nd edn. (2006), p. 6. 2. Anon., Life and Times, of Mrs. Lucy G. Thurston: Wife of Rev. Asa Thurston, Pioneer Missionary to the Sandwich Islands, Gathered from Letters and Journals of Extending Over a Period of More Than Fifty Years (1923; repr. 2010). My best wishes to your mother and to you. I hope it all goes smoothly and they get it all. Excellent post, Lindsey – I have been thinking of all of you this afternoon. Lindsey, You are a good daughter to come home and be by her side .. My thoughts are with you, your mom, and grandma. Oh, Lindsey! I do pray everything went well, the doctor’s hands were gifted and guided and the prognosis is excellent. Please, when you can, let us know how things are going. THAT is the quote that should be on any survivor’s shirt, mug, label, bumper sticker, FOREHEAD! I agree. Best quote I’ve ever read. Thank you so much. It was one of the quickest posts I’ve written, and so I was not sure if I should publish it or do a bit more research. It’s heartening to know it resonated with so many people. My mother came through the surgery well and preliminarily, it looks like the cancer did not spread to the lymph nodes, although we are waiting on the pathology results. Lindsey, fabulous post. Uncle Jim and I are keeping your mom, you, Chris and your grandma in our thoughts. I’m sure it’s a great comfort for her to have you there and a comfort for you to be close. Much love. Lovely Lins. Just lovely. Honoring your mom, Ms Lucy Thurston and every single woman that has gone through (or will go through) this experience with such words is incredible. Your quote rings true for cancer fighters / survivors everywhere. I was at work playing MJ over and over (from his Invincible soundtrack) on my iphone during her surgery. 🙂 Not a waking minute went by today without thinking of her, you, GMA, Chris, the whole family. What a deeply moving post. Thank you. One of our oldest and dearest friends underwent surgery for a tumor this week, too, so it was all the more poignant for me. I do hope your mother continues to enjoy life. Thank you so much – it’s amazing how many people have been touched by this disease. I hope your friend is on the mend as well. My mother has also had a mastectomy and your description of a life that suddenly contained cancer resonated deeply with me. She is now fully recovered, but it was a very difficult time for her and for our family. I cannot imagine how much worse it would have been if there had been no anesthetic during the surgery. Thank you for this post, my thoughts and best wishes are with your mother. It is comforting to know there are others who have gone through this and come out the better for it. I hope your mother is doing well. Thanks for your comments. I was diagnosed with breast cancer in April last year, following my first routine mammogram in March. Since then, I have been under the care of Mr Linforth and the Specialist breast care teams at St Lukes/BRI and St James, Leeds. I just wanted to say thank you and to say how much I appreciate the excellent care I’ve had from everybody involved in looking after me. All the doctors and their individual temas have treated me with the utmost kindness and nothing has been too much trouble for them. Its terrifying when something like this happens to you, but knowing you’ve got such a good medical team of people looking after you, doing their best for you, but who are all so lovely as well makes all the difference! Everybody has been great and I would just like to say a special thank you to my Breast Care Nurse Kath Hodgson. Wow. You, sir, are a wonderful example of a man. Your wife must smile every day you are by her side. I am ever-thankful to have married my husband. I only had a lumpectomy and after I’d healed, he was just as you described. I felt loved and beautiful and secure. Very different from my poor aunt twenty years ago whose husband said she wasn’t a woman anymore without her breasts. Your wife made a wise choice marrying you! 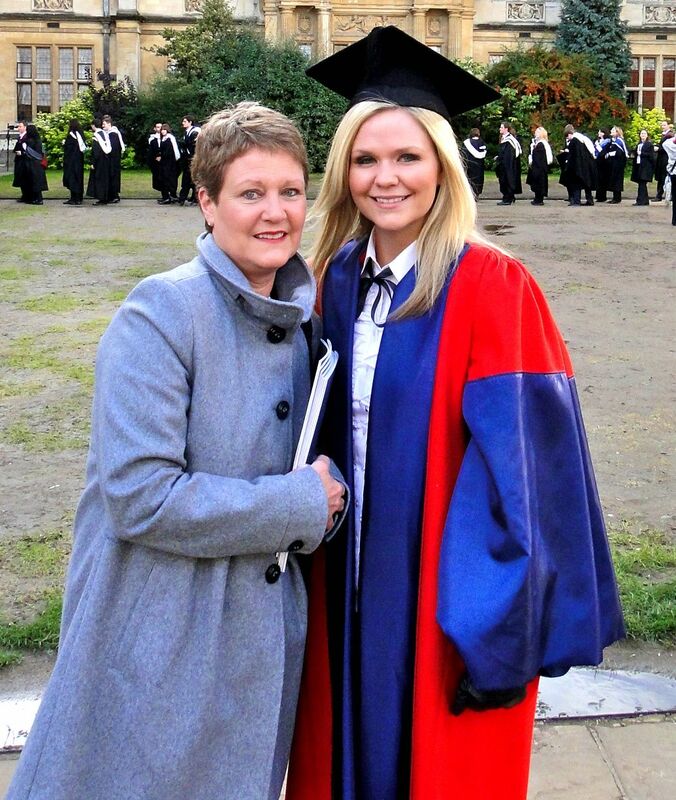 Lindsey, my mother has breast cancer which seems to be under control. I follow you on Twitter as FizzieLou and I just want to say that you and your mother are in my thoughts and prayers. Thank you so much for your kind words. She is on the road to recovery, although she is battling an infection brought on by the surgery at the moment. It is a difficult time but it is always good to hear from those who have been through it and come out the better for it 🙂 Thanks for following the blog! Thank you so much – it is always heartening to hear of others’ stories. My mother’s surgery went very well and as of now, she is cancer free. The tumour was small, and has a low chance of recurrence so she does not need to undergo chemo. She just needs to be on drug therapy for 10 years. We are very optimistic! Glad to hear your sister is strong and well today! This is a tough read, but also a testament to some tough women. Tell your sweet mama that good thoughts & best wishes are coming her way from Texas. I got an infection, too, after my mastectomy and while it’s all sorted out now, it was an epic mess. I say this not to scare you or your mom but to provide proof that while it was even worse than the cancer, I got through it and she will too. I hope all has gone well for your mother in her recovery. Prayers! Lindsay — I just sent you an e-mail on this very subject, and here is the historical information I was seeking. I’m also pleased to see from the notes that your mother is doing well. We are blessed to live in such enlightened times, with pain killers and anesthetic and reconstructive surgery. My best to you both, and to her continued recovery. Thanks Susan! My mom is doing really well. She’s chosen not to have reconstructive surgery at this time, but is very happy with that decision. We are, indeed, lucky to live in the 21st century. I got your email and will try to respond shortly! Hi Lindsay sorry to read about your 1ststill grade teacher. Thoughts & prays coming your way. How’s your mother doing now?